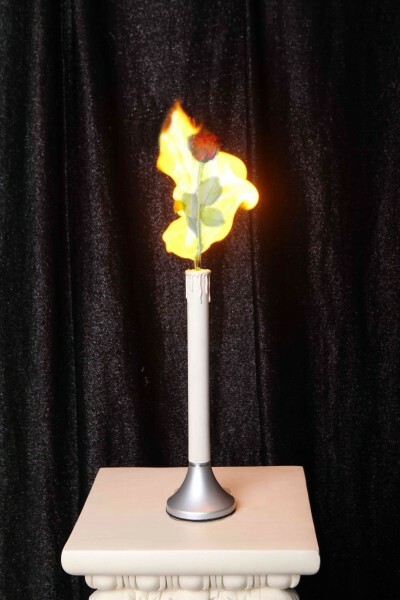 Firstly, the candle starts igniting by itself.After that, you get a fresh rose to appear in a flash of the candle flame. Estimated Delivery Time: 15-39 days (ships out within 5-8 business day). 2 effects in 1 device. Firstly, the candle starts igniting by itself. After that, you get a fresh rose to appear in a flash of the candle flame. - Now you don't have to keep a fresh rose in your pocket. - You can get a fresh rose to appear without a need of its prior hiding in your costume. - Now you don't have to worry that your rose might get broken. - You are free in your movements before and during the performance.